The Tampa Bay Lightning kicked off their 2018-19 season Saturday night by welcoming their in-state rivals, the Florida Panthers. The pregame atmosphere was joyous. Fans milled around, clad in bright blue jerseys and smiled from ear-to-ear. It was easy to see how much this team means to so many people. His friend, Patrick Bonelli, talked about the overall impact of the team on this town and the Tampa community. 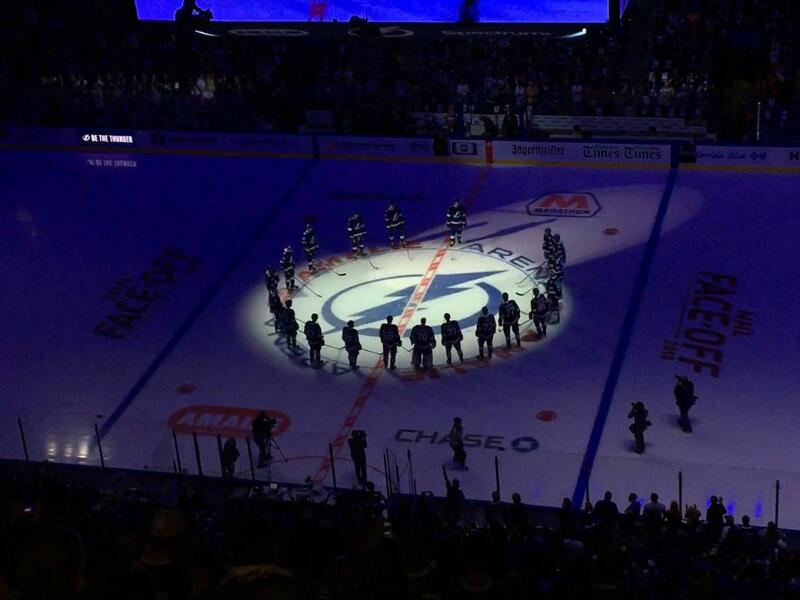 The Lightning have had to fight for their place in this city’s hierarchy of sports. The team was never fully embraced by Tampa Bay until 2004, when they captured the franchise’s lone Cup. And even after those years the team struggled to retain support as ownership groups came and went. But there are many fans that endured, like Ken and Sue Lynn. They have been regulars at Lightning games since the franchise began, in the days of Expo Hall and the Thunderdome, and certainly noticed the difference owner Jeff Vinik has made. The Lightning last played a meaningful game on May 23rd, a 4-0 loss to the Washington Capitals in Game 7 of the Eastern Conference Finals. Although it eliminated the team from the playoffs and dashed any hopes of winning the Stanley Cup, the memory was not dwelling in some fans minds. “It’s a new hope, the beginning of a new season,” Mark Italia said, a half-season ticket holder since 2012. Italia is a transplant fan, previously having lived near Anaheim and Washington D.C. But Lightning hockey has become a staple in his life, something he is able to share with his son, Sebastian. His favorite part of coming to games? The Lightning did not exactly inspire confidence in the hopeful fans, albeit en route to a 2-1 shootout victory. They were considerably outplayed by the Florida Panthers in the first period, giving up an early goal to Cats defenseman Jacob McDonald about six minutes in to the game. Florida outshot the Bolts 16-4 in the opening frame. “We weren’t skating in the first period,” Lightning head coach Jon Cooper said. “For whatever the reasons were, they were much better. They were beating us to the pucks. Tampa Bay came out much better in the second period, creating several chances on an early power play and nearly capitalizing on an extended shift in the offensive zone halfway through the frame. Ondrej Palat missed a wide open net on a rebound during a late power play. Despite outshooting the Panthers in the period 14-8 and Florida switching goaltenders – James Reimer replaced an injured Roberto Luongo at the 12:21 mark of the period – the Lightning still found themselves trailing 1-0 at the second intermission. As if that was not frustrating enough, the Lightning had at that point gone about 200 minutes since their last goal, dating back to game five of the Eastern Conference Final in May. The frustration continued into the third period. Tampa Bay found itself on the penalty kill three times, including a questionable tripping call against defenseman Brayden Coburn that occurred barely a minute after killing off a different penalty. But the Lightning penalty kill came up huge, going five for five on the night. Vasilevskiy played a huge part in that, stopping all 12 he saw on the kill. He made 42 saves on the night. Forward Anthony Cirelli was also huge for the penalty killing-effort, playing nearly four minutes with a man down. And just 20 seconds into the fifth kill of the game, Cirelli started a two on one with Alex Killorn. He outwaited Panthers captain Alex Barkov, staying with a blocked pass attempt long enough to stuff the puck into the open net and even the score. The Lightning survived to overtime, and after trading several chances, the teams headed for a shootout. JT Miller scored a weird goal and Vasilevskiy stopped Barkov and Hoffman. But it was Nikita Kucherov, held without a shot in 22 minutes of ice time, who sealed the two points for Tampa Bay. The Lightning are off until Thursday, October 11th, when they will face off with the Vancouver Canucks.